In Ireland, Applegreen is the public name of Petrogas Ltd, who own a large number of petrol stations of varying sizes, many of which have taken over from previous providers. They later introduced the brand into the UK via a series of small forecourts. Applegreen provide the fuel at many Irish motorway services, and are currently the only operator in Northern Ireland. Since 2016 they have been keen to break into the UK mainland's motorway market, planning several new services. In November 2018 they purchased a significant stake of UK operator Welcome Break. Applegreen's main presence as a major operator is in Ireland. Applegreen franchises include Burger King, Subway and Costa. Previously, Wimpy was a common sight. Their restaurants used to consist of aCafé and Food to Go. The former became The Bakewell (sometimes branded 'The Bakewell Kitchen') and the latter became Freshii. The optimistically-titled SuperStop is a consortium of Applegreen, TOP Oil and Pierse Contracting, with Applegreen being the most publicly active partner but the ownership split evenly between all three. SuperStop won the contract to design, build, finance, maintain and operate Ireland's first six motorway services from 2010 until at least 2035. After the first three of those opened, the rest were postponed indefinitely. Applegreen objected to the decision to award the next three services to Topaz in 2015, instead of their own consortium. Their bid was named SuperStop 2. SuperStop services follow the peculiar Irish design of having the filling station before the car park. Before Applegreen won the contract as SuperStop, they were unhappy with the delays to opening motorway services in Ireland, and built a large petrol station and Subway at M1 J5, Balbriggan. They claimed it was Ireland's first motorway service area, but it was never and still isn't signposted as such. Applegreen have since set up a number of similar sites which have been signed. Applegreen has had its sights on forecourts beyond Ireland, and in July 2017 they purchased 34 filling stations in South Carolina, USA. In August 2017, Applegreen purchased seven forecourts in the UK for £21m. These were purchased from the Carsley Group and are mostly on the A1. This marks a major opportunity for Applegreen to start appearing along major roads in England, with some busy sites, where they will be introducing their food-to-go range in an effort to raise their profile before any potential motorway services open. In August 2018, Applegreen made a further move by confirming that they intend to purchase 55% of an existing UK motorway services operator, Welcome Break. Applegreen claim that they will be responsible for the brand's overall "strategy and operations", while Welcome Break's management will take responsibility for Applegreen's existing UK locations. The change will take effect in January 2019. 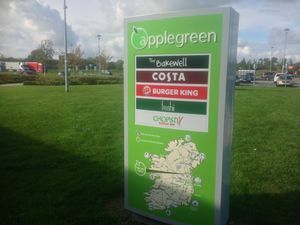 Applegreen operate both of Northern Ireland's motorway services, and a number of privately developed sites on the Irish motorway network. The following services appear to still be actively considered by Applegreen. Following the takeover, if these are built, they would almost-certainly be branded Welcome Break.